For pickup truck drivers, the name “Ford” is synonymous with power and performance. For decades, the brand has been setting the bar with its powerful vehicles and incredible capability, and the new 2017 Ford F-150 near Brainerd, MN is certainly no exception. His heavy-duty full-sized pickup is ready to take on whatever your day throws at it. Whether you need a massive payload or towing capacity – the F-150 is ready to deliver. This year, the 2017 Ford F-150 is poised ready to take out the competition with its impressive specs and features. One of the shining aspects of the F-150 is its customization. Between three engine options and three cab options, it’s easy for any driver to find the exact model that they’re looking for. The 2017 model is available with a Regular Cap, Super Cap and SuperCrew Cab, making it a viable option for drivers that need extra room for passengers. When you get behind the wheel of the 2017 Ford F-150, the power at your disposal is apparent. You really can go wrong with any of its engine options – the 2.7-liter V6, the 3.5-liter EcoBoost V6 and the 5.0-liter V8 – as each deliver a tremendous amount of power, with the Eco option maxing out at 375 horsepower and a segment-leading 470 lb-ft of torque. You wouldn’t expect a large truck like the F-150 to have such a dynamic drive, but Ford has always been about going against the norm. With its new 10-speed automatic transmission, this truck is able to offer superior acceleration and performance that is quick to adapt to your driving style. It goes without saying that the new Ford F-150 comes with the strong, durable construction we all know and love. And with its new military-grade aluminum body and high-strength steel frame, the F-150 is lighter and more efficient than ever, without sacrificing power. The new F-150 is able to achieve 19 city / 26 hwy mpg. Here at Houston Ford of Pine River, we have a wide selection of F-150 models available for you to choose from. With so many options available right here, it’ll be easy for you to find at least one model that catches your eye. You can begin your search today right here on our site by browsing our online inventory by clicking the button above. After narrowing down your choices, just give us a call here at Houston Ford of Pine River, or fill out the form right here on this page and submit it to us. 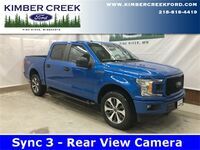 We’ll work with you to get you a test drive in the 2017 Ford F-150 model of your choice here in Pine River, MN, just outside of Brainerd. Interested in a 2017 Ford F-150?